Automotive Parts Business | KEIAISHA CO., LTD.
Keiaisha manufactures a wide variety of automotive parts under a fully integrated production system, from new vehicle conception to welding and coating, utilizing superior metal molding and welding assembly technologies. We have an especially strong reputation in mold production and deep drawing technology, specializing in production of high-precision engine and suspension parts. 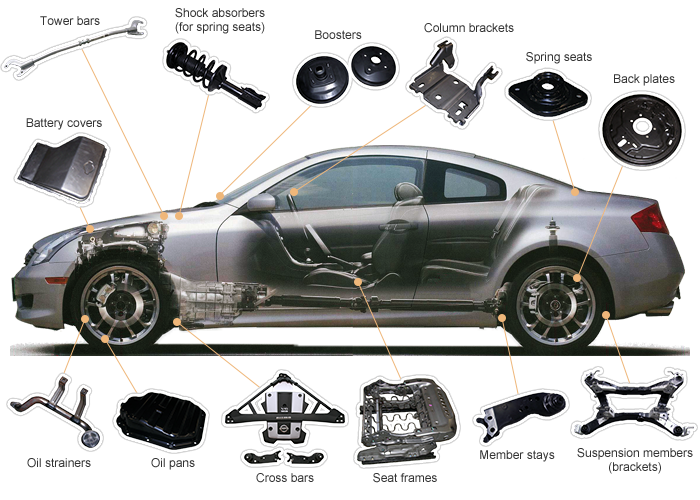 Our manufactured parts are used by numerous automakers all over the world. We have established a fully integrate parts manufacturing system, from pressing to welding, assembly, machining, and cation coating. In addition to providing a versatile technological service through our concurrent engineering system, we have adopted a just-in-time (JIT) system for production and distribution to reduce delivery times and costs. Blueprint-less prototypes and mass production. We offer services to determine specifications required for mass production and concrete proposals for cost reduction measures. We have constructed a system for performing testing and measuring for module orders from automakers, including establishing a temperature controlled room housing CNC 3D measuring, contour measuring, circularity measuring, and 3D image measuring equipment. We have developed a parts production process with 3D/CAD data as a central component, enabling blueprint-less prototype and mass production. Further, ingenuity at various points in the process, such as mold NC processing with CAD/CAM linkage, and automation of many production lines, has drastically reduced delivery times. Four of our plants in Japan have obtained ISO 9001 certification for quality management systems, two of which have also obtained ISO/TS 16949 certification. Our facility in North America has also received ISO/TS 16949 certification. Three of our plants in Japan have received ISO 14001 certification for environmental management system quality standards as part of our active efforts to live up to our fundamental principle of "continuous development of a recycling-oriented society". Following to our first overseas operation in US in 1988, we have opened Mexico Plant in 2015. Furthermore, we have acquired our own production base in Thailand in 2016, establishing a global production and distribution base. We coordinate each other among Japan, US, Mexico, and Thailand, responding to the clients'needs for local production for local consumption. We offer proposals to suit individual client needs based on 3D/CAD and CAE strength analysis. Inspect of press mold products for potential fissures and creases in advance using CAD data. We have established a dedicated division to ensure quality assurance of the goods delivered to our clients. Our goods are inspected using many measuring and testing machines to make sure they accurately meet the technical specifications our clients require. Along with our superior quality control, we constantly strive to make sure our accumulated expertise is reflected in the steady improvement of our products and facilities, and to increase client confidence in the work we do. Having three 3D measuring machines enables us to provide timely measurements. Measures curved parts forms faster by comparing with 3D data. Capable of testing particular vibrations and endurance of a wide range of items, including auto machinery, aerospace machinery, electronics, and precision equipment. We can evaluate the endurance of machine parts using a servo-hydraulic testing machine. Applies tensile and compressive loads to perform tensile and compression testing. Copyright © 2015 Keiaisha Co., Ltd. All Rights Reserved.